A map is something we’ve all likely held in our hands, scratched our heads over or marked with pushpins to show where we’ve been and where we’d like to go next. Maps are used to visualize the greater world, to find our way to places we’ve never been before, and to help us navigate even when we can’t see. There are thousands upon thousands of different maps from every conceivable era of time designed by extraordinary and ordinary people, depicting people and places as they are and as they were seen. Maps can be strictly geographically accurate or drawn based on perceptions; no matter what kind of map it is, much more than just location can be learned from each and every one. A common understanding of a map is one that is a flat or 2D representation of a location. Maps, however, can also be there dimensional such as a globe or a 3D virtual globe (like Google Earth). 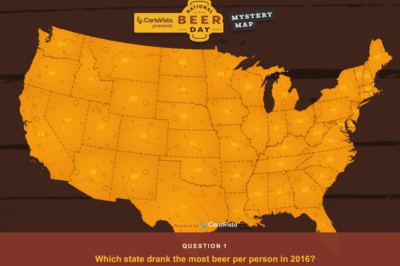 Maps can show a perceived or actual relationship between objects, regions, or ideas whether real or imagined. 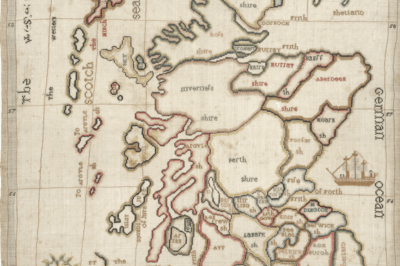 The creation of maps throughout human history have given researchers great insight into how different cultures and civilizations saw the world around them based on how they made maps and what was depicted on those creations. Maps commonly have a few features that allow them to be read universally. These features include a compass rose which shows where due North, East, South and West are in relation to the landforms on the map. Modern maps typically are drawn with North at the top, but this is not always the case and certainly wasn’t for many thousands of years (see: map orientation). Maps also have a scale, which shows how small the picture is in relation to the actual size of the landmass shown on the map. This is sometimes shown as a ratio like 1:1,000,000 or ‘one centimeter equals 100 kilometers’ on the map. Different maps use symbols to show rivers, lakes, cities, capitols, different kinds of roads (like highways or side streets), and different environments such as deserts or marshlands that exist in the region. These symbols are shown in the key or legend, a box on the map that deciphers these symbols for quick and easy map reading. 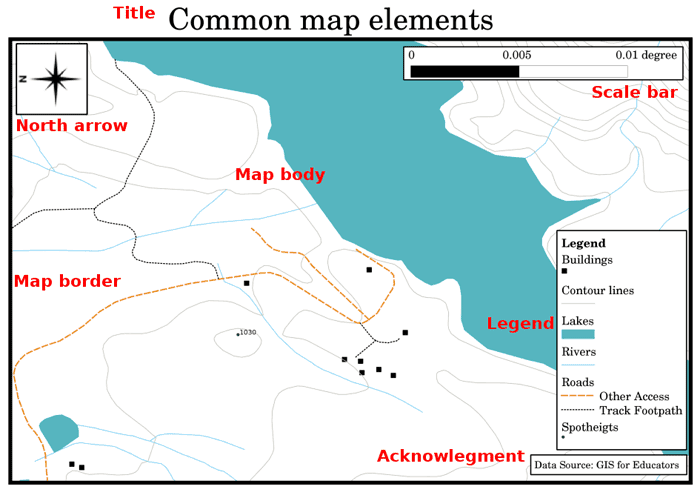 Common elements of a map. Used with permission, QGIS. Maps were created using stones, clay, and other materials common to the regions they were made. These maps were often very abstract, as early civilizations didn’t have the ability to map and scope locations specifically or mathematically. Therefore these maps are made with certain cities or countries at their centers, rather than a cardinal direction like North. Evidence of this is seen in early maps showing Jerusalem as the center with cities like Acre, Aleppo, Damascus, Amman, and Tyre around it; some maps discovered in Japan can only be read when aligned with the imperial palace. Early maps were also often drawn with an emphasis on the waterways nearby, whether these were the oceans or seas nearby or local rivers and lakes. Water was and continues to be the most important resource for sustaining civilizations and therefore was shown on maps very early on. Today we have the ability to create map projections, or ways of seeing the 3D world on 2D surfaces. Each projection has its pros and cons, as it is impossible to create a 100% accurate flat representation of a 3D surface without distortions. Common projections are the Mercator Projection, Cahill’s Butterfly Map, Wagner VI Projection, and the Mollweide Projection. These are only a few of the many different kinds of modern map projections we have at our fingertips! Being able to map the world around us is a skill that cartographers (map makers) have continued to learn and perfect over years of work and study. Maps of ancient civilizations helped us create our understanding of the world today in addition to how they saw the world around them then. Who knows- in a thousand more years, how much more of our world will we be able to map, and what will people then think of our maps now?